The Chenille plant is the common name for two related, but different species. 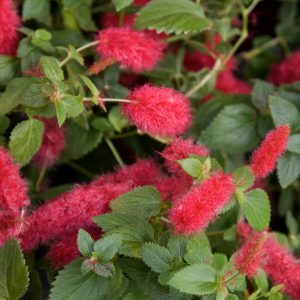 The first is Acalypha hispida, commonly called the Chenille plant, the second is Acalypha reptans commonly called the ‘Dwarf Chenille’. These are a very showy plant when in flower, the flowers look like long caterpillars and have the texture of the fabric which bears the same name, and this is where the get their common name as Chenille is french for caterpillar. Both are characterised fluffy red flowers, however they do differ in growth habit. A. hispida is taller growing to around 2m (6ft) in height, brilliant red flowers. The plant itself is upright and the large red flowers hang down. It prefers a well drained soil and grows well in full sun to part shade. This is plant that is best pruned regularly to maintain shape and size. Also known as ‘Red Hot Cats Tails’ and tends to have longer flowers than below. A. reptans is a lower growing plant, suited to hanging baskets and for use as a ground cover plant in warmer climates. A number of named varieties are available including, ‘Summer Love’ and ’Stephie’. Both varieties require a warm climate to thrive, they do not tolerate frosts or cold wet winters. A. reptans, is a little easier to grow in cooler climates as is smaller, can be grown in hanging baskets and is easier to over winter indoors. Soil – Use a humus rich moist yet free draining soil or potting mix. Moisture – Keep the soil or growing medium moist. Position – A warm position with some humidity is best. Flowering time – Late spring through summer depending on the climate.